Drill presses are ideal when you have a lot of repetitive work to do. They ensure that you have consistent results each time. But when you consider all the different brands and features available, it can be a little overwhelming to choose the best one for your needs. We’ve chosen five popular drill presses from WEN and Skil to help you narrow down the choices. They range from the 8-inch WEN 4208 for home workshops up to the WEN 4214 for production environments. There are also presses that offer increased capacity with precision lasers for accuracy. Let’s review the highlights of each one to see which one will suit your shop. The WEN 4208 is a solid choice for home workshops and novice woodworkers. Since it has a ½-inch chuck, it’s compatible with a wide range of bits. And the 1/3HP motor is powerful enough for common jobs. 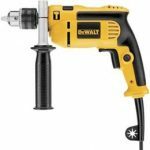 It can even drill a half-inch hole through cast iron. Also important is the fact that the WEN 4208 offers five different speeds for handling a variety of materials. By moving the belts inside the head you can choose between 740, 1100, 1530, 2100, and 3140rpm. And the spindle itself travels up to two inches vertically, locking into place for repetitive and accurate drilling. The beveling worktable tilts up to 45 degrees either left or right, and it adjusts up and down, too. It measures 6-1/2-inches square. One other essential feature to consider on the WEN 4208 is its swing or throat. That measures how far from the edge of the material it can drill. The 4208 has an 8-inch swing from the center of its chuck to the support column. That means it can drill through the middle of a disc measuring 8 inches in diameter, or 4 inches in width from the center of the material to the column. 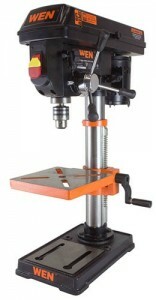 If you want a drill press with a larger throat capacity, take a look at the next one below. The first difference you might notice when you compare the WEN 4210 to the WEN 4208 above is that the 4210 has a larger capacity for bigger projects. First, it has a wider swing, or throat, of ten inches. You might also see that it has rack and pinion height adjustment instead of a smooth column. Plus, the worktable is a little larger at 7-5/8-inches square. And the spindle travels a little farther, up to 2-1/2-inches. As for similarities to the WEN 4208, the 4210’s cast iron worktable bevels up to 45 degrees either left or right. It also has five speeds from 570 to 3050rpm and a 1/3HP single phase motor. To change the speed, you’ll need to move the belts on the pulleys inside the head. But if you go back to the features that set the WEN 4210 apart, you’ll find that it comes standard with a work light and a precision-enhancing laser. The laser literally marks the spot with an X to help you get the hole in the right place every time. Now, if you find that the capacity of the WEN 4210 isn’t quite enough for your projects, check out the WEN 4212 drill press below. The WEN 4212 has more power and a slightly higher capacity than either the 4210 or the 4208 drill presses. 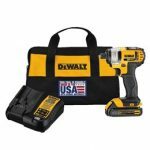 To begin with, it has a 2/3HP motor that allows it to drill larger holes in tough materials although it still has a ½-inch chuck just like the other two machines. Another bonus of the 4212 is that it doesn’t just offer five different speeds, it has infinitely variable speed between 530 and 3100rpm. The transmission keeps the speed steady while the LED readout confirms it. And you won’t have to adjust the belts to change the speed manually. All you need to do is rotate the lever. The spindle travel, or stroke, on the 4212 is 2-3/8-inches, a bit more than on the 4210. While the throat or swing is still ten inches, the cast iron worktable is larger, measuring 8 by 7-2/3-inches. And just like the one on the 4210, the worktable has rack and pinion height adjustment, plus it bevels up to 45 degrees. The WEN 4212 also comes equipped with a laser for accurate drilling every time. The laser marks an X on the material with red light precision. But oddly enough, there is no work light like you’ll find on the 4210 and the 4214. But if the capacity of the WEN 4212 isn’t enough to meet your needs, take a look at the 12-inch swing of the WEN 4214 below. 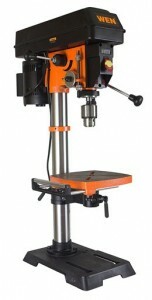 The largest capacity drill press in this review is the WEN 4214. It has a wider throat, longer stroke, larger chuck, and bigger worktable than any of the other WEN drill presses described above. To start, the 4214 has a 12-inch swing allowing it to drill through the center of a 12-inch diameter disc, or 6 inches from the edge of a material. It also has a 3-1/8-inch stroke or depth that the spindle can travel vertically. Plus, the 5/8-inch chuck allows you to use larger bits than you can with the ½-inch chucks on the other drill presses. Meanwhile, the 2/3HP motor supports infinitely variable speeds between 580 to 3200rpm, giving you more flexibility. And you won’t have to adjust belts to make a change manually. Just turn the lever and watch the LED display to see the speed. Like the other cast iron worktables on the other drill presses above, you can bevel left or right up to 45 degrees. But this table is larger, measuring 9-1/2-inches square. And it has rack and pinion height adjustment. Plus, it comes with a table roller extension that expands its capacity up to 17 inches. Finally, the WEN 4214 comes with both a work light and a precision laser. These two tools help you get the work done faster and more accurately. Why include the SKIL 3320 drill press alongside four others from WEN? It’s here mainly because you can see how the two brands measure up against one another. The SKIL press comes with a longer warranty, but in many ways, it’s similar to the WEN 4212. To start with, the SKIL 3320-01 has a half-inch chuck for compatibility with most common bits. Its motor offers five different speeds ranging from 570 to 3050rpm. But you’ll need to manually adjust the belts on their pulleys to set each speed. While you work, you’ll have the advantage of an X2 laser to mark the precise spot where the bit will drill. And you can raise and lower the worktable with the help of the rack and pinion system. The ten-inch swing lets you reach five inches from the edge of the material you want to drill. And you can bevel the cast iron worktable up to 45 degrees right or left. But the spindle travel is a mystery as SKIL doesn’t include that information in their specifications. 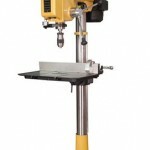 Finally, why might you choose the SKIL drill press over one of the models from WEN? Jump down to the recommendation section below to find out if it’s worth the investment. If you want a basic drill press for small projects, try the WEN 4208. It has an 8-inch throat and a half-inch chuck. It has enough power to drill a half-inch hole in cast iron. There are only two downsides. First, is that you’ll need to adjust the speed manually by moving the belts on their pulleys. 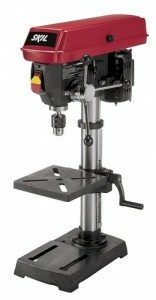 Then this is the only drill press in this review that lacks rack and pinion adjustment for the height of the worktable. 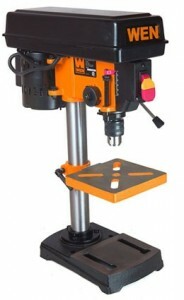 Next, the WEN 4210 has a ten-inch swing, plus a longer stroke, and a larger worktable. Again, although it has five speeds, you’ll have to move the belts each time you want to make a change. This extra step may not bother you if you mainly drill in the same kind of material. And this press comes with two extras: a work light and a laser. All these features together make the WEN 4210 the best value if you don’t need a larger capacity drill press. Alongside the WEN 4210 is the SKIL 3320. The SKIL comes with a slightly larger worktable and a longer warranty. But its five manually-selectable speeds require you to move the belts on their pulleys just like on the WEN 4210 and 4208. But it also has a laser, although it does not have a work light. Moving up in capacity, you’ll find the WEN 4212 with a precision laser. It has infinite speeds between 530 and 3100rpm, and you won’t have to move any belts to select them. Just rotate the lever and watch the LED readout. The 4212 also has a larger worktable, more powerful motor, and deeper stroke although it only has a ten-inch throat. Finally, the WEN 4214 has the largest capacity of any of the drill presses in this review. 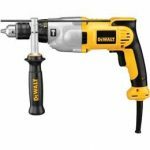 It’s nicely suited to larger projects because it has a twelve-inch swing, a 5/8-inch chuck, a longer stroke, and infinitely variable speeds between 580 and 3200rpm. It also includes a table extension that expands up to 17 inches. Plus, it comes standard with both a work light and a laser. 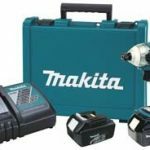 If you do a variety of drilling projects in a wide range of materials, this could be the best investment for you. Click here to purchase WEN 4208 on Amazon.com! Click here to purchase WEN 4210 on Amazon.com! Click here to purchase WEN 4212 on Amazon.com! Click here to purchase WEN 4214 on Amazon.com! 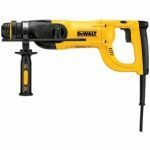 Click here to purchase SKIL 3320-01 on Amazon.com!